Alois Kracher is one of the world’s great sweet wine makers. 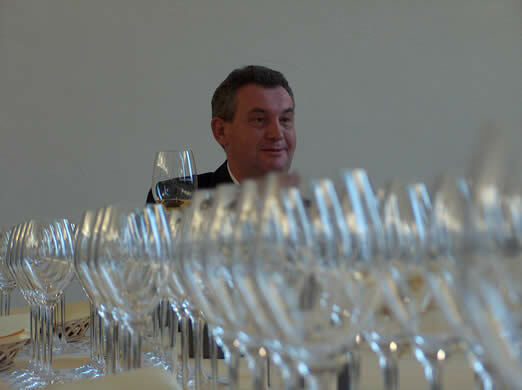 As I was tasting through the line-up of his 12 numbered sweet cuvées from the 2002 vintage, I was amazed by not just the consistency of quality, but the way each wine expressed its own personality. In some ways the wines reflect the man: Kracher himself is a striking character. He’s the sort of guy that looks you in the eye as he gives you a bone-crunching handshake. We gathered in Illmitz on a damp autumn evening for a prelude to the main event the following day: the annual showing of the new releases. In mid-October Illmitz, near the Hungarian border, has a sleepy, out-of-season feel to it. This atmosphere is compounded by the fact that it’s dark and drizzling as we arrive. It would be a much livelier place in mid summer, as Lake Neuseidl is a big draw for holidaymakers. Indeed, we meet for dinner in the restaurant at a large holiday complex – so large, in fact, that Valentina, our host from Austrian PR agency Wine and Partners, gets hideously lost on the way out and we end up driving for ages on a confusing road network though endless chalets and caravans. Slightly surreal. 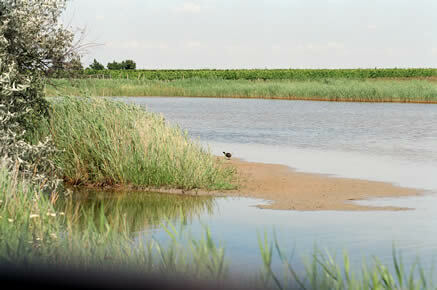 The particular area where Kracher has his vineyards is called the ‘Seewinkel’, a stretch some 20 km wide along the shore of lake Neusiedl in the Burgenland region. It’s a special location: during the cool autumn evenings a heavy fog from the lake develops, which hangs around the vineyards until midday. These are conditions tailor made for botrytis, the noble rot, a vital ingredient for making great sweet wine. Making these wines is a waiting game. 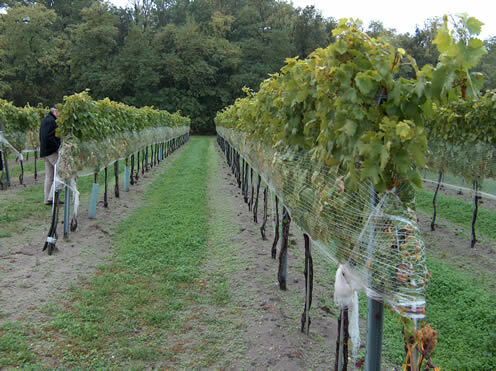 The grapes are left on the vine well into Autumn – so they need to be heavily netted heavily to protect them from hungry birds – and it’s a question of letting the rain and fog provide the right conditions for botrytis to attack the already ripe grapes. It must be a nervous business to be in. Kracher began making wines in 1981, when he took over from his father. It’s true to say that his efforts – in both making great wines and also marketing them enthusiastically – have almost single-handedly put the Neusiederslee region on the map as one of the world’s leading sweet wine regions. Two styles of wine are made. 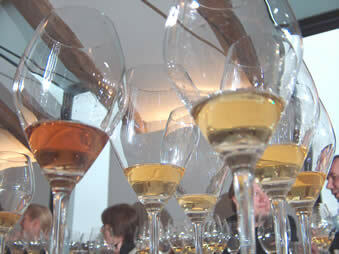 Zwischen den Seen (between the lakes) wines are made with a focus on freshness and fruit, fermented in stainless steel. The Nouvelle Vague wines are vinified and aged in barriques. The cuvees are labelled with numbers reflecting concentration; in 1995, for example, there were 15, and in 2002 there are 12. Within the numbering scheme, the wine with best balance is labelled ‘Grande Cuvée’. Some years, things go right. Some years they don’t. This is partly why Kracher has diversified – he runs a wine import company, and makes products such as wine vinegars, cheeses, wine jellies and chocolates in partnership with other expert producers. These other businesses help to keep the cashflow going so that Kracher can continue to be obsessive about the quality of his wines. 2002 and 2003 were contrasting years. 2002 is one of the best vintages he has experienced – Kracher puts it on a par with 1999, both just behind 1995 which remains his best vintage ever. 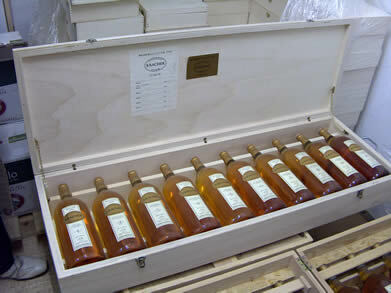 2003 was a disaster and won’t result in any top sweet wines, because of the paucity of botrytis this year. ‘After harvest we had 58 different lots of trockenbeerenauslese (TBA)’, says Kracher. ‘Then we put together what works together in terms of flavour’. In the vineyard Kracher has 78 parcels to work with, totalling 32 hectares, in three different crus. Two thirds are on gravelly soil, and a third is on a mix of gravel and sand.